Going inside of a Red Panda zoo enclosure! My boyfriend and I love the zoo, and we love cuddly animals. 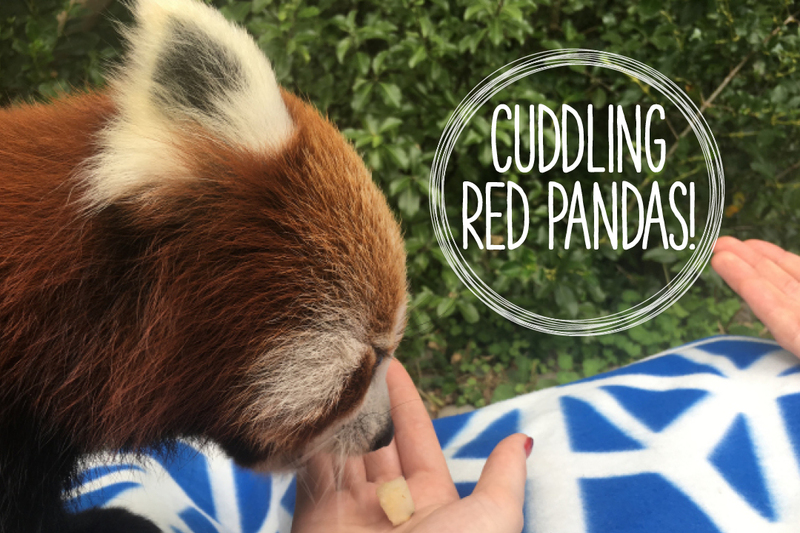 Whenever we go to the zoo together, we spend approximately half the time at the red panda enclosure, simply because they're just so darn cute! So it was a no brainer that going inside of the red panda enclosure would be the perfect gift for his birthday. Firstly, let me just say a big thank you to Wellington Zoo for all their hard work with their animals, they really do a fantastic job. #NotSpon. And in timing with the recent events that occurred at Wellington Zoo, they really deserve all the help they can get to help home and protect these animals. What's really cool is they have an on-site surgery room, where they perform surgeries on animals that have injured themselves (whether that's on the zoo animals, or animals that have been brought in from the wild) and the public are able to watch the surgeries be done. It's truely fascinating! Anyway, on to the red pandas! 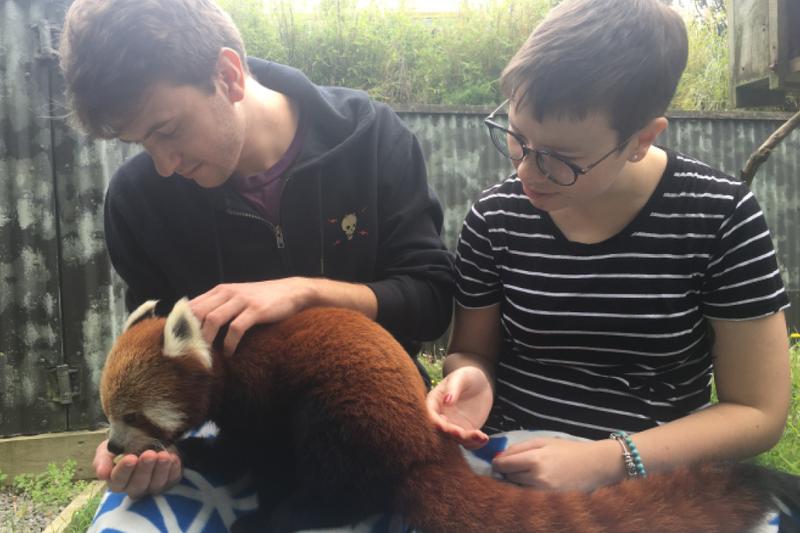 During our encounter, there was myself and my boyfriend, and a mother and her son (early teens), so it was a very small group, which was fantastic as we didn't have to share the red panda's attention with lots of other people. This was also great for the red pandas themselves as they didn't get overwhelmed with all these humans looking at them (I doubt the zoo allows large groups into the enclosures anyway). We met the zoo keeper outside the enclosure and then went inside with cushions and a thick blanket each. 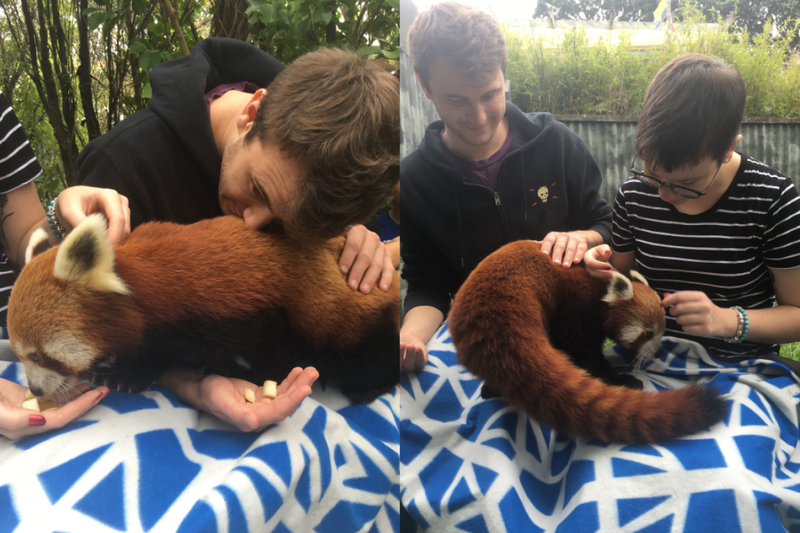 Red pandas, like most animals, can be fussy when it comes with interacting with humans, so we had to all sit on the ground with these blankets on us (their claws don't retract well, so to save our legs being scratched we had these thick blankets over our laps). We sat down inside each enclosure (we were meeting two males, and they need to be in seperate enclosures, alpha male dominance and all that) with some snacks for them and waited for them to come to us. 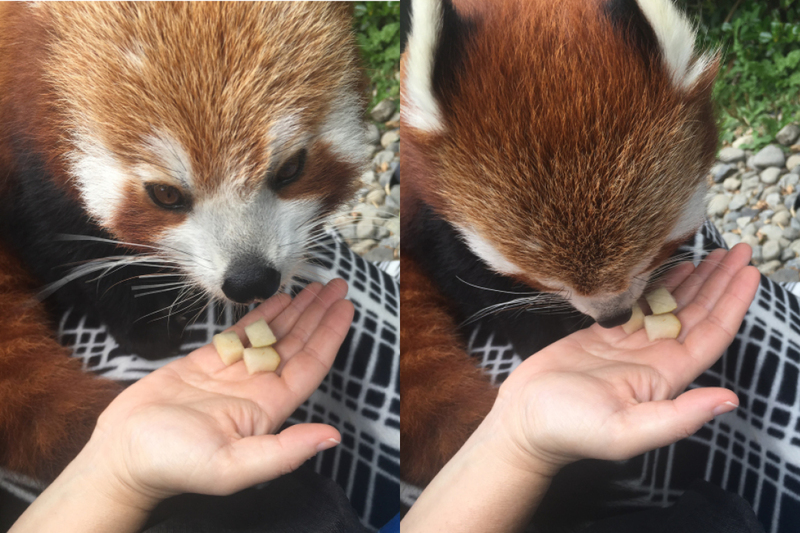 Which took no time at all as the snacks that get used in the encounters are special treats which the red pandas obsess over - grapes and pears. It was safe to say that once the food was gone, so were they! Now, unfortunately red pandas are not very cuddly, they don't like being constrained. Which broke both my boyfriend and I's hearts as all we wanted to do was pick them up and smoosh them like you would do a cat. Sneakily, my boyfriend found a way around this and when the red panda walked across his legs, he gently placed his head down onto the red panda's back as a half-cuddle. Whenever we reflect back on this encounter, he always says this was his favourite part. My favouirte part was very similar. When we ran out of food for the first red panda we saw, he was running around all of us to see if we were hiding any food from him that he could get his widdle hands on. Unfortunately for him it was all gone (they hover that food up like a vacuum! ), but one of the ways this red panda did to find any food we could possibly be hiding from him was to climb up our legs just like a cat or a dog would do - I think I died and went to heaven right there and then! 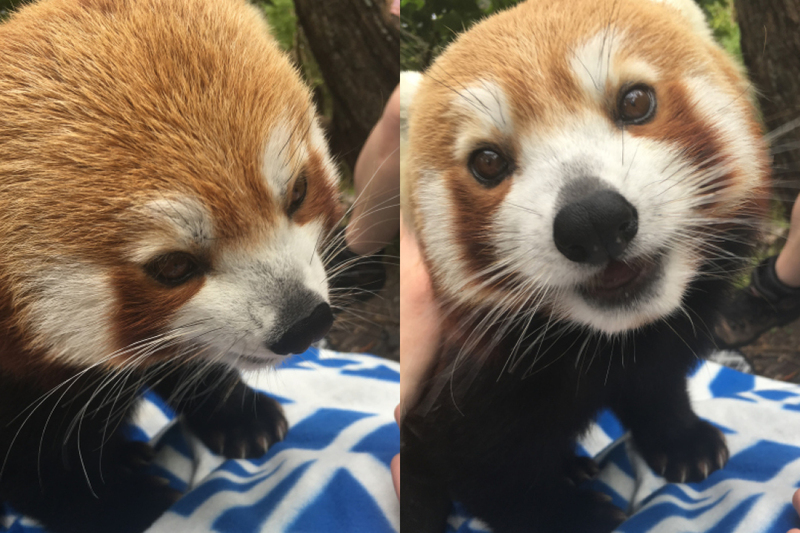 I'd say that the red pandas are like kind of like a cat or puppy; they're so soft and fluffy and are only interested in you if you have food like a cat, but their fur was also very thick and they'd excitedly climb all over you like a puppy! Honestly, the best of both worlds! 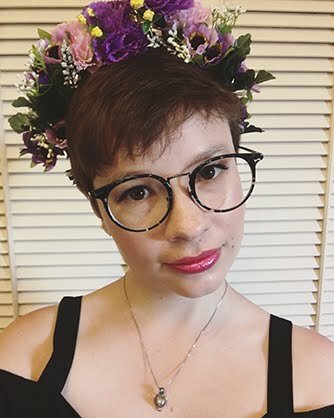 I had read online that they smell really nice, so of course my boyfriend and I gave them a sniff when we had a chance, and they smell so rustic and warm - obviously because they live outside! The zookeeper didn't judge us as she said she's sniffed them many a times! Their claws were pretty thick and sharp, but they were also very careful with them, and sometimes when they put their little paw on our hand as they ate (I know, adorable!) they were very careful to only touch us with the pads of their feet. 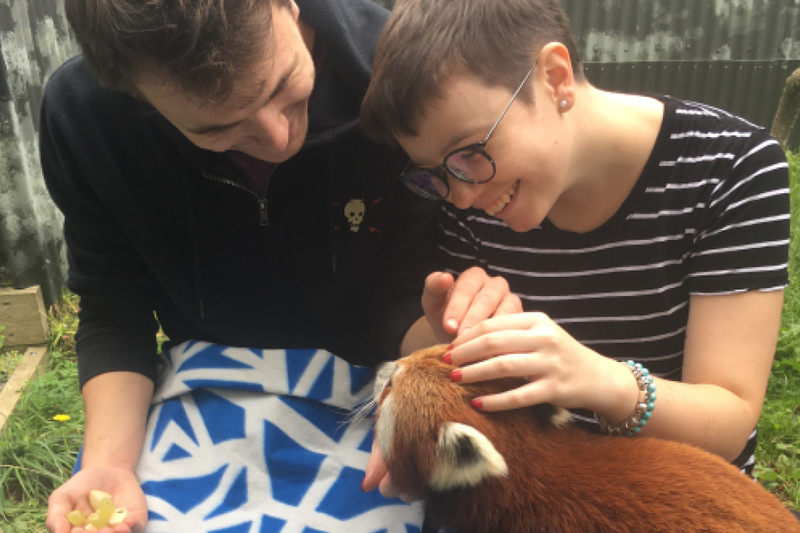 I absolutely loved going inside of the red panda enclosure, and I urge anyone who is even thinking about it to definitely save up and give it a go! I've not-so-subtly hinted at my boyfriend that we should go inside the meerkat enclosure for my birthday, because those little critters are so silly and cute! I hope you enjoyed this fuzzy and loving-filled blog post, because I (and my boyfriend) sure did enjoy looking back at the photos and reminisce about our experience! Is it weird to say that we miss the red pandas?! Have you ever done a wild animal experience before? What did you get to see and do?! I'd love to hear! I love the red pandas as well! I always find myself staring at them the longest when I go to Auckland Zoo. So cuuuute. Hi Alisha, I love them so much, they're so soft and cuddly! If you ever get the chance I'd definitely say you should go! Red pandas are so incredibly cute Louise. Beautiful creatures. I find it so neat you get to go inside the enclosure to spend time with the cuties. They are so cute! I love them so much, they're climbing the hierarchy in my favourite animals! It was super fun, I definitely recommend it!